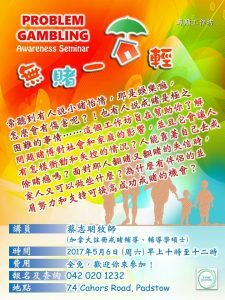 How can you be free from gambling? Is constant gambling making you feel miserable and helpless? Will you lose everything and destroy your family before you stop? Inner Journey believes a person is more likely to quit gambling if they have constant support and encouragement from others who understand what they face. This support group bring together gamblers and ex-gamblers for sharing, learning and healing. Inner Journey is led by Rev Tony Choy who is a Certified Gambling Counsellor; Marriage and Family therapist and Associate Fellow of the Hong Kong Professional Counselling Association.